MacGyver is in Turkey to lend Phoenix Foundation support to an archaeologist father/daughter team that is searching for the tomb of Alexander the Great which contains the valuable Eye of Osiris. Beth, the daughter, secretly helps a corrupt treasure hunter in exchange for money, to her and her rude father’s later regret. 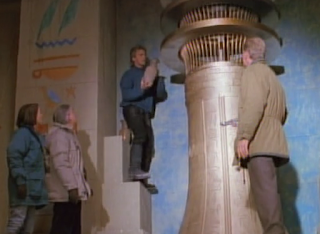 The treasure hunter and the Eye of Osiris end up sealed in the tomb (which MacGyver found), and there is a reconciliation of father and daughter. "Feel Lucky?" ~A little person who pulls a knife on MacGyver in the opening scene. MacGyver fends him off with a scarf and then takes the little person and hangs him on a light fixture. Not much to choose from here. At one point, he takes a sugar-water mixture and sprays it on the sandy artifact remains to harden it up. Let's go with that. Watching this episode with Mom! "When are we going to get to the good ones?" she asks. "At this rate, in about 5 years," I answer. I kid, I kid. Who knew Turkey had pine trees just like western Canada? Sorry, I had to. I generally don't like to critique actors (don't want to hurt anyone's feelings), but Beth struggles a bit. Our first Kai Wulff sighting! He ends up appearing in 4 different episodes as 4 different characters. Always does a great job as the bad European guy. In this episode, he’s one of the Von Leer brothers, the first of which perished in "Legend of the Holy Rose." "What do I want with that [the artifacts] when I can't even read hieroglyphics or ancient Greek?" ~Von Leer. Good to see he's thought this thing through. I’m a big snowcat fan. Would be great to traverse the Wisconsin winters. Probably a little out of my price range though. I like how MacGyver sees the shining blue light and yells "There’s our way out," which he somehow immediately knows. And then Von Leer comes back with an even more over-the-top "A hah ha ha, the eye is mine!" I normally don’t think of myself as a claustrophobic person, but the scene toward the end where MacGyver, Beth, and the Professor are lying on their backs with a wall no more than three inches above their head makes me feel claustrophobic. I don’t even like thinking about it—let’s move on. Not as slapstick as my least favorite episodes but there are some bad moments. Generally I enjoy treasure hunting/archaeology type stuff, though this episode doesn’t do much for me. Next up, we’re staying in season 6 for some more borderline slapstick! Totally agree with you on the claustrophobia attack with them trapped under the big rock! Glad they fell to freedom before they (or I) had a chance to panic about it. Glad I'm not the only one who felt claustrophobic there - makes me feel more normal! Interesting idea about dubbing, I hadn't thought of that. That might explain why her speech sounds kind of wooden. Okay, we're way off on this one, an adventure episode that represented this show at its most ambitious for episodic network television before the era of widespread CGI. And I found nothing about the episode remotely slapstick. The exposition at the beginning was dry at times, but the layering of the story and the ultimate significance of the "blue eye" and the four elements working together to open the lock mechanism was MacGyver at its most brilliant. This episode was a treasure....and I ranked it #22. This felt like a season 1 episode with the treasure hunt plot, generic Asian/Turkish/Egyptian militia, over-the-top villain and ambitious but ultimately creaky looking set. Perhaps trying to mix Turkey and Egypt in Canada with Alexander The Great and a hammy Von Leer brother was a little bit much! I did really like the statue of Ra that was dug up and the statue of Anubis in the temple, they were almost Stargate prop prototypes, and it was nicely familiar to hear Richard saying "Anubis" a few times too in preparation for his battle against the so named baddest of baddies in SG-1! The tree of life opening mechanism was also a very ingenious idea, although like all the episodes where MacGyver figures out cryptic archaeology instead of the experts it did rather devalue the professor. I'm glad someone else noticed Beth's voice sounded strange, it reminded me of those moments in season 1 when MacGyver's mouth didn't say the words he spoke! "Watching this episode with Mom! "When are we going to get to the good ones?" she asks. "At this rate, in about 5 years," I answer. I kid, I kid." "I normally don’t think of myself as a claustrophobic person, but the scene toward the end where MacGyver, Beth, and the Professor are lying on their backs with a wall no more than three inches above their head makes me feel claustrophobic. I don’t even like thinking about it—let’s move on." I know!!!! ACK! Yes let's move on!